A careful reading of his essay ‘Intellect’ supplies a clearer understanding of what made Emerson ‘tick’. He is better seen not as an essayist, poet, or philosopher, but as a sage. Yes, even in modern times the world supplies sages and bards – men and women able to communicate exceptional, even supernatural wisdom and insight. Emerson’s appeal is universal because what he wrote was inspired by a source higher than the logical mind. He was one of those rare individuals who not only heard and recognized the voice of his Muse or Genius, but was able to write down what it told him without censoring, editorializing, or distorting the message. Emerson’s essay on Intellect is especially valuable because here we have an inspired genius writing about inspiration and genius. Much speculation has been raised about Emerson’s method of composition. One common view is that he recorded inspired thoughts that came to him more or less spontaneously – during walks, reading, or reflection – in his voluminous journals. When it came time to write an essay, he simply culled relevant passages from his journals. This often gives his essays the appearance of a series of disconnected but provocative sayings. 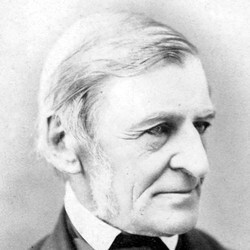 If so, then more so than with most authors, the essence of Emerson’s thought can be presented as individual aphorisms. Here are examples from ‘Intellect’. Source: Emerson, Ralph Waldo. Intellect (1841). In: The Complete Works of Ralph Waldo Emerson. Vol. 2. Essays: First Series. New York: Houghton, Mifflin, 1903-1904. (pp. 324–347). The first questions are always to be asked, and the wisest doctor is graveled by the inquisitiveness of a child. In the fog of good and evil affections, it is hard for man to walk forward in a straight line. What am I? What has my will done to make me that I am? Nothing. I have been floated into this thought, this hour, this connection of events, by secret currents of might and mind, and my ingenuity and wilfulness have not thwarted, have not aided to an appreciable degree. Our spontaneous action is always the best. You cannot, with your best deliberation and heed, come so close to any question as your spontaneous glance shall bring you, whilst you rise from your bed, or walk abroad in the morning after meditating the matter before sleep on the previous night. Our thinking is a pious reception. Our truth of thought is therefore vitiated as much by too violent direction given by our will, as by too great negligence. We do not determine what we will think. We only open our senses, clear away, as we can, all obstruction from the fact, and suffer the intellect to see. We have little control over our thoughts. We are the prisoners of ideas. They catch us up for moments into their heaven, and so fully engage us, that we take no thought for the morrow, gaze like children, without an effort to make them our own. By and by we fall out of that rapture, bethink us where we have been, what we have seen, and repeat, as truly as we can, what we have beheld. As far as we can recall these ecstasies, we carry away in the ineffaceable memory the result, and all men and all the ages confirm it. It is called Truth. But the moment we cease to report, and attempt to correct and contrive, it is not truth. All our progress is an unfolding, like the vegetable bud. You have first an instinct, then an opinion, then a knowledge, as the plant has root, bud, and fruit. Trust the instinct to the end, though you can render no reason. It is vain to hurry it. By trusting it to the end, it shall ripen into truth, and you shall know why you believe. The differences between men in natural endowment are insignificant in comparison with their common wealth. Do you think the porter and the cook have no anecdotes, no experiences, no wonders for you? Every body knows as much as the savant. All men have some access to primary truth. In common hours, we have the same facts as in the uncommon or inspired, but they do not sit for their portrait. The intellect is a whole, and demands integrity in every work. This is resisted equally by a man’s devotion to a single thought, and by his ambition to combine too many. Truth is our element of life, yet if a man fasten his attention on a single aspect of truth, and apply himself to that alone for a long time, the truth becomes distorted and not itself, but falsehood. Neither by detachment, neither by aggregation, is the integrity of the intellect transmitted to its works, but by a vigilance which brings the intellect in its greatness and best state to operate every moment. God offers to every mind its choice between truth and repose. Take which you please, — you can never have both. Between these, as a pendulum, man oscillates. He in whom the love of repose predominates will accept the first creed, the first philosophy, the first political party he meets, — most likely his father’s. He gets rest, commodity, and reputation; but he shuts the door of truth. He in whom the love of truth predominates will keep himself aloof from all moorings, and afloat. He will abstain from dogmatism, and recognize all the opposite negations, between which, as walls, his being is swung. He submits to the inconvenience of suspense and imperfect opinion, but he is a candidate for truth, as the other is not, and respects the highest law of his being. Happy is the hearing man; unhappy the speaking man. As long as I hear truth, I am bathed by a beautiful element, and am not conscious of any limits to my nature. The suggestions are thousandfold that I hear and see. The waters of the great deep have ingress and egress to the soul. But if I speak, I define, I confine, and am less. One soul is a counterpoise of all souls, as a capillary column of water is a balance for the sea. The Bacon, the Spinoza, the Hume, Schelling, Kant, or whosoever propounds to you a philosophy of the mind, is only a more or less awkward translator of things in your consciousness, which you have also your way of seeing, perhaps of denominating. Say, then, instead of too timidly poring into his obscure sense, that he has not succeeded in rendering back to you your consciousness.